Say Hello to Cragmere www.cranevista.com. Hello, and welcome to Cragmere Villa, an award-winning luxury villa next to the world-famous Crane Beach and Hilton Grand Vacation Crane Resort. With outstanding cliffside panoramas of the Caribbean Sea and easy access to the world-famous Crane Beach next door, this stunning oceanfront villa offers guests a luxurious haven to relax and unwind! Barbados offers a perfect Caribbean getaway with turquoise blue waters, a warm sunny climate year-round and diverse activity and nightlife options. The villa itself offers a private, covered terrace with cosy furniture, a private 40 foot infinity pool and private 6-8 person hot tub as well as two dreamy daybeds. Relax with a morning coffee in the gazebo on Cragmere’s cliff-side terrace while soaking in the sea views and tropical breeze. When the tide is out the villa also has it own little beach, perfect for body boarding or a refreshing dip. The alfresco dining area with sea views makes a great place to share dinner with family and friends. On hot days head next door to the world famous Crane Beach or go for a dip in the 40 ft infinity, cliffside pool— it’s an awe-inspiring spot day or night thanks to contemporary underground lighting, cushioned lounge chairs and panoramic ocean views. You won’t need to lift a finger during your stay , book a private chef to take care of the meals and enjoy complimentary housekeeping staff which ensure the place is tidy. Cragmere also offers concierge services- if you need to book a car, catamaran cruise, island safari tour, for example, Cragmere’s house manager can arrange all of that for you. A housekeeper is included in your stay and she will come five days a week - half day. Step into the inviting living area which features plush sofas, armchairs and island-inspired painting from acclaimed artists. The main home features 5 well appointed bedrooms and feature artisan-crafted mahonony beds, A/C, en-suite baths (5) with opulent marble tile, crisp high thread count linens, comfortable mattresses— and the high-speed wi-fi is on is. Cragmere is the perfect choice for families, couples, friends, weddings and events. 	Five bedrooms, five and a half baths, 4 bedrooms with oceanview, 3 bedrooms with King beds, 1 bedrooms with Queen Size bed, 1 bedroom with two twin beds (perfect for kids), which can be converted to a King. Crane Beach is widely rated one of the Best Beaches in the world..now is your chance to find out why! The Crane Beach is easily accessible through the Crane Resort, for example, if you do some shopping or buy a meal, or around the resort where this is a walking path providing easy access. #23 BEST BEACHES IN THE WORLD – CNN . Cragmere Villa has received top awards on Trip Advisor, Flipkey and VRBO over the last several years. Located on the Southeast coast of Barbados, within walking distance to the Crane Resort, Cutters Deli and Foul Bay. The world-famous Crane Resort features 5 restaurants, a bar, a grocery store, an ice cream and coffee parlour and and duty free shopping.. Cutters Deli is an English style delicatessen. Emerald City, the local American style supermarket, is a ten minute drive from the villa. The airport is also a short ten minute drive from the villa. -Can we choose our menu with the chef? Yes the chef can customize a menu to meet your needs. We can also offer vegan or vegetarian options. -What times of the year is the beach in front of the house available? The beach is always there, however it depends on tides as to how large it is. From May to November we experience less wind and typically the beach in front of the house is larger but only when the tide is out. The ocean at the beach below is also swimmable and ok for snorkeling etc. You are within walking distance of two very large and beautiful beaches as well - The Crane beach and Foul Bay Beach. - Is the Crane Beach safe for children? -What form of payment will you take if we book with you directly? -Curious if you offer any one bedroom discounts? -Do you allow weddings or events? -Do you have privileges to use the Crane Beach or do you have to pay for the lounge chairs as a "non resort guest"? -Are rental cars not necessary? If we do get one, do we need 4 wheel drive for hilly terrain like some other islands? -Are there any bedrooms on the first floor? Do you have a floor plan buy any chance that you could share? -We have children staying with us which will make the total number of people staying more then 10- are you able to accommodate? -Can you provide an all-inclusive price for meals and a chef? Can you request specific meals from the chef and are their vegan options? Yes the chef can customize a meal to suit your needs. They can also prepare vegan and vegetarian meals upon request. -How deep is the shallow end of the pool? -Do you deal with travel agents? -We have children that require a crib - is this possible? Location, location, location: the villas is next to the “Top Ten Beaches in the World,” which makes for beautiful wedding memories… and photography. It’s easy to get married here! The country’s legal requirements make it straightforward to get married in Barbados and The Crane offers you a hassle-free resort wedding. I live in Halifax, Nova Scotia, Canada and have several master degrees in business and real estate in Toronto and Sweden. I grew up in the hospitality industry and am fortunate to have a great teacher- my father Tim Moore. He has founded several national organizations including AMJ Campbell Van Lines and Premiere Executive Suites. 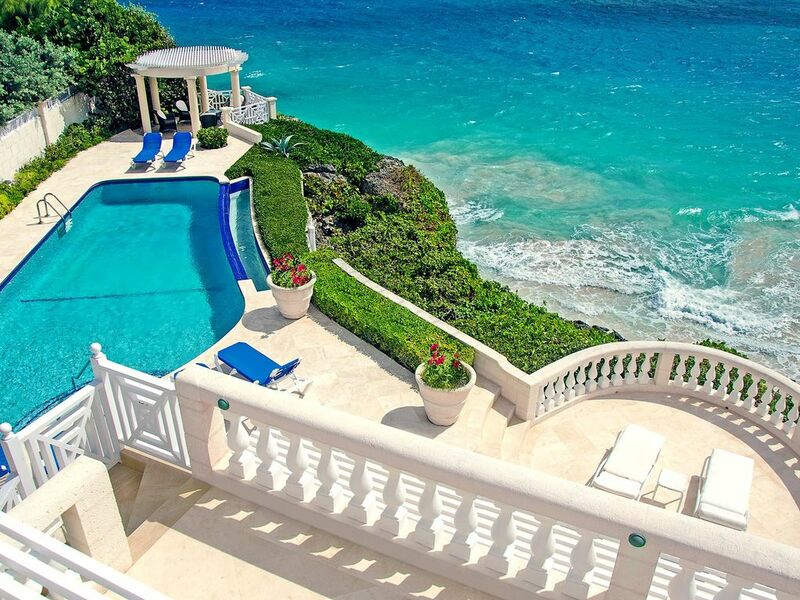 The latest ventures that I am a partner in is Moore Suites, Oceanstone Resort and Crane Villas Barbados. Some of my favorite travel desinations are Iceland, Norway and Barbados. One of my favorite things about travelling is meeting new people, making new friends and learning about different lifestyles. I also love to learn new things whether it be new food, languages, music or hobbies. As a host, I strive to provide the highest quality of service in the industry and am continually looking for ways to improve my guests experience. I treat everyone like family and friends and believe this is a crucial part of my guests travel experience. chef is available at the cost of $100 per meal plus the cost of groceries or $150 for 2 meals/ day. Kitchen can also be prestocked with groceries at the cost of $50 US plus the cost of groceries. This hideaway spot, sandwiched between Crane Beach and Fowl Bay Beach was ideal for our 2 families! This house was wonderful! Perched on a hilltop with a stretch of incredible and dynamic vistas! With waves crashing, the wind whistling through the palm trees- it was heaven! The icing on the cake was a full moon that rose up to illuminate the turquoise waters below. It was pure magic. We were celebrating my sister's 60th birthday and we had both our families together. We chose this house because we thought it would be more fun for our college age kids who were looking for waves and surfing action. The house works well for those who want to get away from the touristy section of the West coast of Barbados and have the excitement of the East side which is more dramatic. We had Hilda cook 3 nights which was perfect home cooking. Cathy helped arrage our transportation and made sure we had everything we needed to have a perfect vacation. Thank you. We hopefully will be back. View is outstanding. Pool/patio/daybeds/hot tub/etc are great ways to enjoy the days. Food choices at the Crane resort and nearby (Marco Polo) exceeded expectations. Will definitely plan on return visit. Visit Foul Bay beach just south of the house. Its a 3min drive and huge beach with almost no one around. And Crane beach is just north with more people and activities. Thank you so much for sharing your beautiful home!! We had a wonderful wee and look forward to returning again soon! The home is spectacular and the location and views beyond anything we have seen before. The attention to detail is incredible and the manager was always available to help or provide recommendations. We really wish we could have stayed longer than one week but look forward to staying another time. The Moore's are the epitome of hospitality in Barbados. This vacation will be forever etched in our hearts. Thank you for sharing your lovely home with all of us- such graciousness and hospitality is amazing! Our vacation was unforgettable. Warmly welcomed by the house manager, we had groceries waiting for us and settled right into life in paradise. The house, pool, and daybed overlooking the cove were all clean and beautiful. The cove, unvisited by anyone during our stay but my girlfriend and me, is populated with sand hued pink by breakdown of corals, families of cute little crabs, and stone pillars erupting out of the earth, with the bases eroded from millennia of tidal action shaping them like mushrooms. Barbados, outside the hurricane belt, offered up humid but sunny weather for our August trip, one of the few places we could go at that time of year in the Caribbean with reliable weather. Renting a car with AC for the week was key, day trips around the island, including scuba diving with Peter and Gaird (best scuba team ever!) at West Side Scuba made returning home to Windermere even more delicious. Rented a catamaran for a sunset dinner cruise (epic, Stacey and Nick were the best! ), did some fancy dining in Holetown (great dinner options up there, also beautiful area with marine preserves to snorkel at), and fed sea turtles, all in a short week we didn't want to end. Matthew Moore and his team made our experience enjoyable and easy from start to finish. Thanks Matthew and Carolyn! Located on the Southeast coast of Barbados, this villa is within walking distance to two of the best beaches in Barbados; Crane Beach and Foul Bay. The Crane Resort, a few minutes walk away, is world famous for cuisine, duty free shopping and their beach was ranked number one in the world. The Crane beach can be accessed through the Crane Resort next door if you buy a meal or groceries (only a 5 minute walk) or around the resort (which is about a 10-15 minute walk). There is also a beach directly in front of the villa which can be accessed by a stairway- however this beach is fairly rough and the most popular one is next door at the Crane Beach.